Well done, Dad. But, I’m Sure Going to Miss You. | My Year Away. And Back. Well done, Dad. But, I’m Sure Going to Miss You. Robert Allan Richter, 90, of Carolina Village, Hendersonville, NC, died August 30, 2016, after a courageous battle with pancreatic cancer. Bob was born in New Britain, CT, on July 11, 1926, to Paul and Helen Richter. He attended New Britain High School, graduating at 16 in 1943. His teenage years were spent on Bassett Street where he was a member of the Bassett Street Bone Crushers, a vagabond group of kids who regularly played a rough and tumble version of street hockey. After graduating from high school, Bob worked as a Pepsi truck driver where he earned the nickname “Pepsi Pete.” Hearing the call of duty, Bob joined the Army, and became a staff sergeant of the military police, mostly in the Chicago area. He often spent his off-duty hours at the legendary Aragon ballroom, jitterbugging the night away to the Big Bands. His 6’7” lanky uniformed frame drew many dance partners. 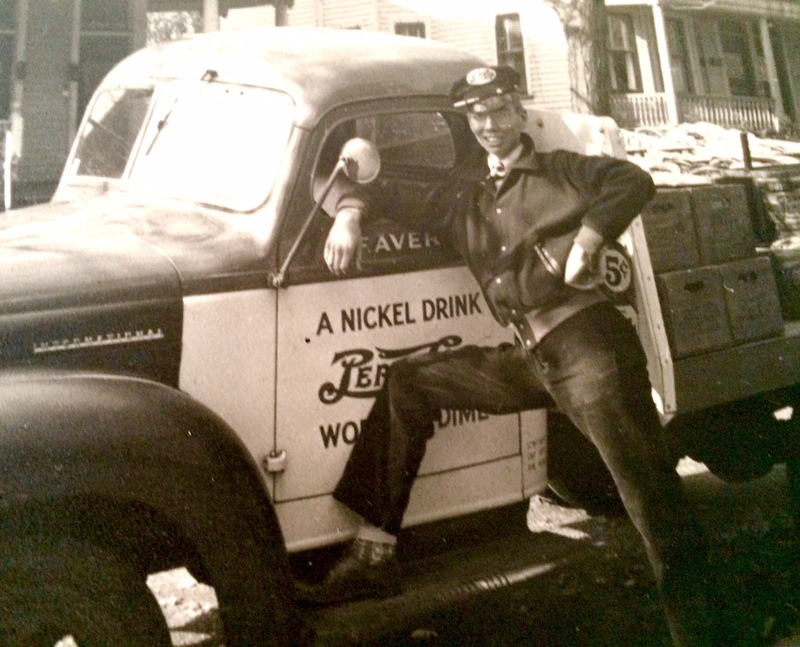 Dad loved driving his Pepsi truck. After the war, Bob attended the University of Maine at Orono where he graduated fourth in his engineering class in 1950. He was a member of the Tau Beta Pi Engineering Honor Society. He also was president of Sigma Phi Epsilon, a fraternity that provided many life-long friends. To earn extra money in college, Bob became the campus photographer, which gained him access to all sorts of events on campus. Toward the end of his college career, Bob met Nancy Richter, a nursing student, on a blind date. In short time, the two were engaged and married on July 7, 1950, in Fort Kent, ME, Nancy’s hometown. After a short stint at a small engineering firm, Bob joined General Electric as a civil engineer, where he worked until his retirement in 1988. Bob’s career at GE took him and Nancy all over the world. Wherever they moved, they made a home for their family. When Bob retired, he asked Nancy where she wanted to live and without hesitation, she said “Hendersonville, NC,” a place they had visited and loved. Settling into an active retirement life, Bob and his golfing buddies played courses all over North Carolina. After 52 years of marriage, Nancy lost her heroic battle with cancer, on June 8, 2004. Bob is survived by his second wife, Elna, whom he married in 2005. Elna’s five children, multiple grandchildren and great grandchildren all welcomed Bob into their family. Also surviving are Bob’s children Helen (Stephen) Gammon of Coventry, RI, Carol (Gary) Pardun of Columbia, SC, grandchildren Carl Gammon of Brainerd, MN, Amy (Joey) Hatcher of Wasilla, AK, Jonathan (Jackie) Gammon of Savannah, TX, and twins Grace (Jim) Alworth and Graham (Sonia) Pardun, both of Minneapolis, MN. Bob also is survived by four great-grandsons: Levi and Luca Hatcher, Jack Pardun, and Archer Gammon. He is predeceased by his first wife, Nancy, and his brother Donald of Manchester, CT.
A memorial service celebrating the life of Bob Richter and the comforting joy of the Lord Jesus Christ will be held on Monday, September 5, 10:00 a.m. in the Village Hall at Carolina Village. The Reverend Dr. Stephen G. Gammon, Bob’s son-in-law, will lead the service. Shuler Funeral Home, Hendersonville, is assisting with the arrangements. In lieu of flowers, the family asks that gifts be made to Four Seasons Hospice, Hendersonville, NC. Bob’s ashes will be spread in the memorial garden at Hendersonville Presbyterian Church, a courtyard of quiet remembrance where members and friends of the church are able to reflect on those who have already joined the great heavenly chorus. Categories: Uncategorized | Tags: Dad, memorial service | Permalink. So sorry for your loss, Carol and family, of a very special man. So thankful that Resurrection shines ahead! Praying for God’s comfort for you all.